Sign up at Slotser Casino on our site to be able use the promos and coupon codes listed below. If slots are your favorite online casino entertainment, Slotser Casino is the place for you! Offering a safe, fair, responsible and social gaming experience, Slotser online casino provides you with a limited but high-quality range of slots titles from their own unique proprietary software as well as from leading casino games developer Microgaming. 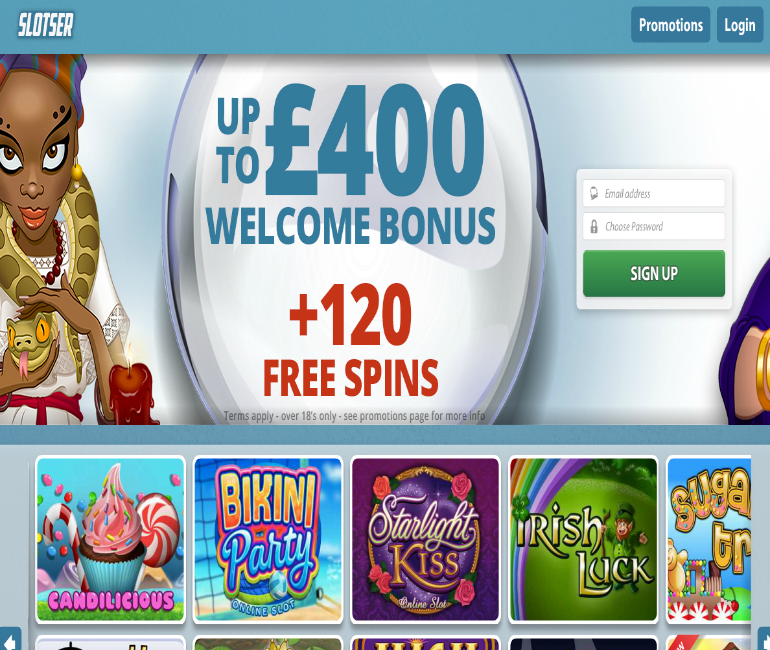 Singup at Slotser Casino and grab a £400 bonus plus 120 free spins! You can also take advantage of other exclusive promotions including tournaments, reload bonuses and giveaways! With its simple and user-friendly design, proprietary slots and 24/7 live chat support, you’ll feel like a slots superstar every time you play at this dynamic casino. Slotser.com is regulated by the UK Gambling Commission and was established in 2014. It is owned by Ever Adventure IOM Ltd. Casinos. It supports multiple languages and is backed by industry standard SSL encryption security protocols. Slotser casino games are powered by the casino’s own proprietary software and Microgaming. The good news is that because it has its own proprietary software, you’ll be able to find unique games that you won’t find at many other iGaming destinations, such as White Wizard Deluxe, Irish Luck, Sugar Train, Cupid’s Arrow, Fluffy Favorites, Temple of Isis and Cirque Du Slotser. On the whole, these games feature simpler graphics than games produced by leading third party developers, but they are charming in their own right and definitely still worth the spin. There’s also popular slots titles from world-renowned Microgaming like Immortal Romance, Thunderstruck, Avalon II, and Robyn. That being said, what’s not so good – and rather surprising - is that the range of slots that Slotser Casino offers is actually rather limited, especially considering that online slots are the only form of casino entertainment that can be enjoyed at the casino. However, you’ll still find multiline video slots, slots with special features and bonuses, 3D slots and slots with progressive jackpots. Games can be accessed directly from your web browser via Instant Play (Flash). The casino has an easy-to-use interface and it is easy to find and access games. At the time that this Slotser Casino review was written, there was no Slotser mobile casino platform. 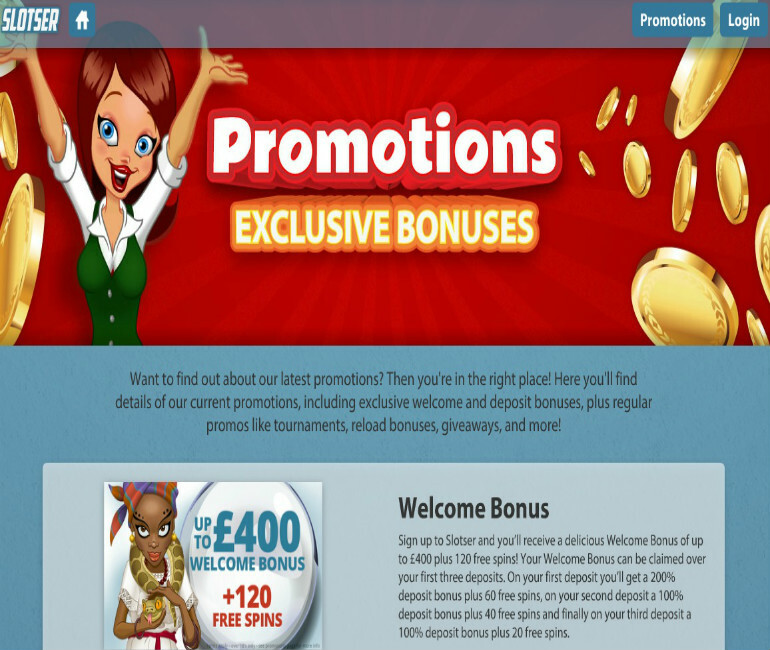 New players at Slotser Casino can claim a Welcome Bonus of up to £400 plus 120 free spins. The welcome offer is awarded over your first three deposits. The first deposit maximum bonus is £200, the second deposit max bonus is £100 and the third deposit max bonus is £100. Players need to deposit a minimum of £10 to claim the bonus. Each bonus has 35x wagering requirements. All wins from free spins are credited to a player’s account as bonus fund and players must wager on free spins 50x to unlock the bonus funds. General Slotser terms and conditions apply. Beyond the welcome offer, other Slotser Casino bonuses include the Bonus Wheel. This promotion is available to all Slotser players. Players can climb Slotser levels and play the Wheel of Slotser mini game, where they can spin the wheel and get the chance to win one of several thrilling bonuses including free bonus cash rewards. Among the popular and secure Slotser payment options you will find include: Visa credit/debit, MasterCard credit/debit, Maestro, Neteller and Skrill. Deposits occur instantly, which is great news because that means that transferring funds is immediate so you can start playing games faster. Withdrawals can take anywhere from 24 hours to 10 business days depending on the payment method that is used. The customer service team can be contacted via live chat from the lobby and through telephone and email. Customer support is available between 9:00 – 19:00 GMT Monday to Friday. There is also an FAQ available that answers some common questions. Slotser Casino has restricted from United States, but you can choose another casinos to play from your country.